The following are the recipients of this first inaugural awards. 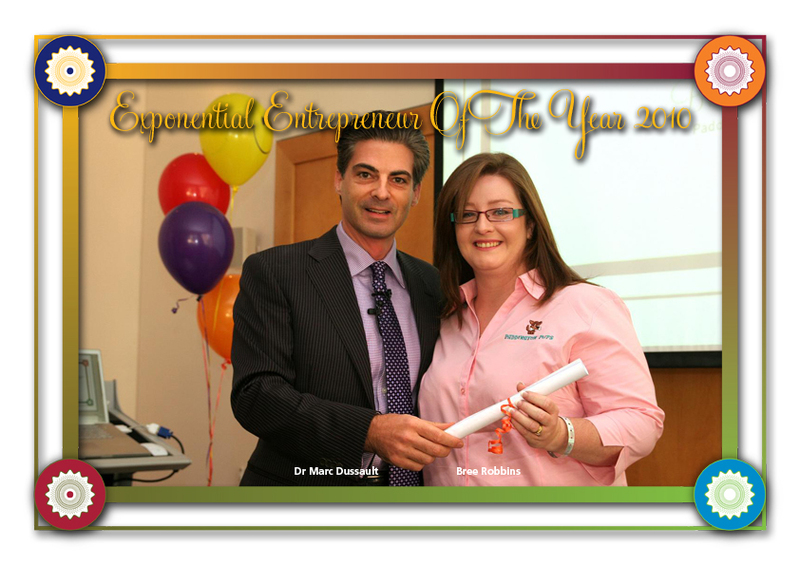 They are presented to entrepreneurs and business people who have demonstrated excellence, deploying exponential strategies in their business by profitability creating exceptional value for their clients in a way that is both measurable and sustainable. 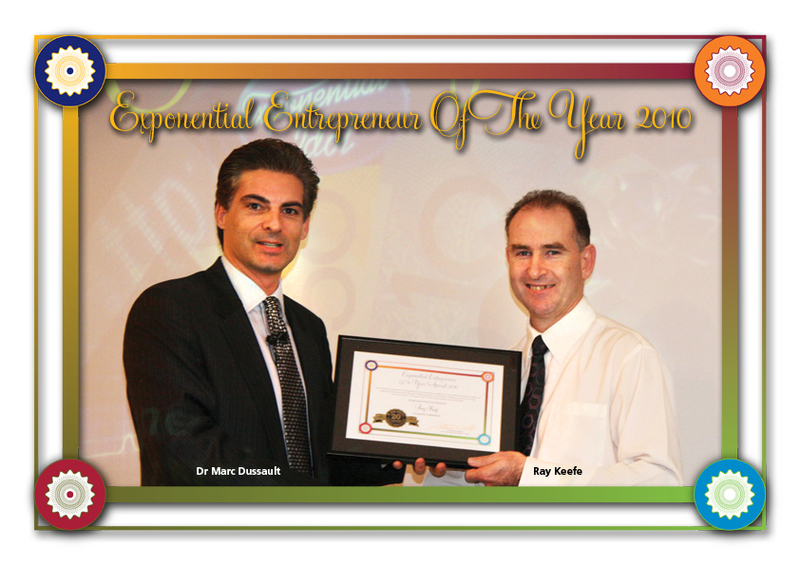 The awards are presented by Dr Marc Dussault The Exponential Growth Strategist, business coach, advisor and mentor. This award is a symbol of all the great things that have been happening at Paddington Pups over the nearly 12 months that Bree has been the proud owner of the store. A lot of hard work and thought has gone into expanding the client base. Doggy Daycare is quite a niche market which has increased the challenge of marketing the business, a much relished challenge that has proven not only achievable but extraordinarily enjoyable. As it turns out Brisbane is full of wonderful people who love their dogs. These people are looking for somewhere trustworthy and positive to place their beloved dogs while they are at work or just out and about. It’s for this reason I have doubled our regular client base and we are getting in new customers and dogs every week. Increased the number of dogs that attend daycare on a regular basis through expanding my client base and improved advertisement and Public Relations methods. I’ve purchased advertisements in highly circulated animal focused magazines, distributed newsletters and cards, and increased our internet traffic dramatically. Added extra play areas for safety and additional control. Initially the dog play area was separated into the two large sections and one small section. One of my first port of calls as owner was to separate the two sections into four sections, giving us a total of five sections. This allows my staff to segregate any troublesome dogs, keep the dogs calm and minimize stress levels. It also means we can comfortably accommodate a large number of dogs and they can be separated and no longer crowded all in two or three spots. Increased dog grooming staff as grooming is a high demand service for any dog related business. Having an extra groomer allows us to give customers the availability they need of us and allows us to provide extra services. Increased doggy daycare dog walkers and play time with staff. The more people supervising a maintaining order the better, and since we are building our clientele base so rapidly it makes sense we would need to bring in more people to compensate. My staff are always experienced and highly trained, they all know how to deal with difficult situations and are comfortable dealing with any breed of dog. Restructured the layout of the shop – with a fresh owner the shop needed a fresh layout. It’s strategically organized to encourage our customers to easily find what they’re looking for and direct them to the things they may need. Implemented additional sterilization processes ensuring that Paddington Pups sterilization is at Vet grade levels. The safety of our dogs is paramount. I have implemented a tri-monthly ‘fogging’ with an anti-bacterial, hypoallergenic spray so now Paddington Pups daycare is sterilized at a level worthy of food preparation (not that I would eat off the floors). We have started working in conjunction with a dog behaviorist which allows us to make sure every dog is enjoying their time in daycare. We consult the behaviorist in relation to dogs with separation anxiety, aggression or dominance issues and any behavioral concern under the sun, so the dogs go home not only tired but happy and sometimes better trained. Launched Paddington Pups on Facebook with its own page to reach out a bit more and make our service more transparent. Our Facebook page allows us to show the loving owners what their dog is getting up to throughout the day and give updates on the goings on of the business. Implemented Paddington Pups Dog of the Month Awards which recognises our more regular or well behaved dogs. This has been an unintentional marketing method with parents so proud of their Fur Babies that they have allowed us to get referrals and reach many more clients than I would have ever thought possible. Plus it’s a fun way to reward my regular clients. Repainted all the floors, not only for aesthetic purposes but also to provide the dogs with stable consistent flooring and for hygiene purposes. Doubled the stock levels in the shop to provide our customers with a larger choice of goods. Paddington Pups now specialises in dogs, whereas it was more a general pet store when I first purchased the business. This change gives us the best range of dog products imaginable. Improved in-house systems dramatically through implementing schedules, charts, whiteboards and blackboards for my staff. Raised $672.60 for the RSPCA cup cake drive. Launched NEW Tricks Classes not previously held anywhere and Dogs Night Out, once again improving the range and services for my client base. Dramatically increased the Paddington Pups website traffic and started blogging with over 109 blog posts covering all things dog related. Been interviewed for a segment in an upcoming book. Nearly doubled the foot traffic of people coming in and out of the shop each day. We have regular customers from the surrounding neighbourhood coming in to get their weekly pet needs. We also attract a good number of new customers being one of the few animal related stores surrounding the city. Overall in 12 months the business has doubled. Paddington Pups has been nominated for the first time in Paws and Claws People’s Choice Awards. We have been nominated in 4 categories; Best Mate, Best Dog Grooming Stylist, Best Pet Store That Doesn’t sell Pets, and Biggest Heart. All this now proudly makes Paddington Pups Queensland’s #1 Doggy Daycare Centre, with food safe levels of sterilization, five safe areas for dogs of all sizes and breeds, looking after up to 40 dogs a day, an exceptional grooming team and daycare team of experienced staff, and a friendly and fun play area for dogs just like yours. 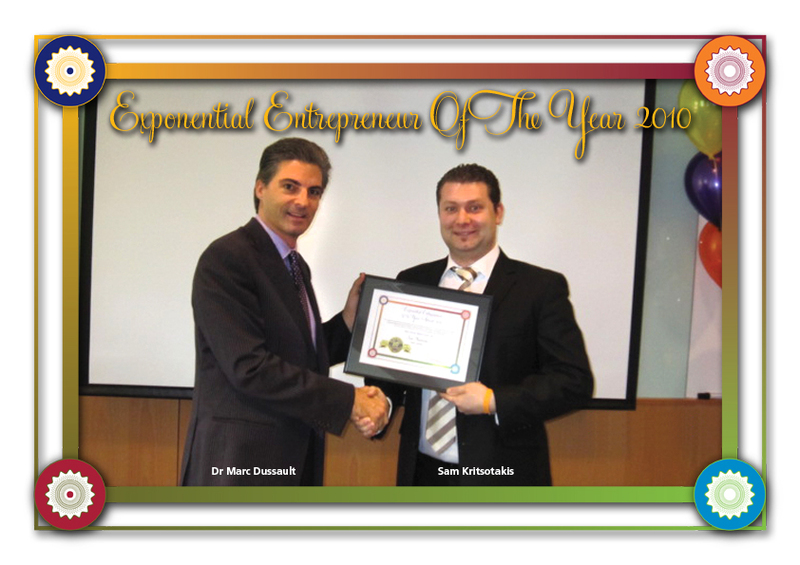 The reason Sam Kritsotakis of Eskae Private Jeweller won the 2010 Exponential Entrepreneur Of The Year Award in the New South Wales Service Industry Category is in recognition of the incredible start to his entrepreneurial career as a business owner. When I first met Sam, he was employed as a bench jeweller and absolutely knew beyond any doubt, that he wanted to be running his own business – he even had the name picked out and registered – Eskae Private Jeweller. Even before he opened the doors to his new Sydney jewelry studio, he knew what his business would look like, how it would run and where the profit centres would be. Not only did he have this information on hand, he had a complete Business Building Blueprint™ filled in before he even had a physical location selected. In other words, he had a complete strategic plan established with a step-by-step process to implement his business vision. Sam is methodical, systematic and disciplined in his approach to setting up and running his business. In fact, he invested 18 months prior to opening Eskae Private Jeweller making sure everything was in place for the launch of his new start-up venture. Too many small business owners are impulsive and short-sighted when it comes to getting started in business. Designed from scratch – the ideal Private Jewelery Studio where he can not only meet his clients privately, but also have a fully functional, multi-bench production jewelry studio to create unique hand crafted jewellery for clients right on his premises. Ensuring quality as well as control of the design process. He achieved operational profitability within 3 months. Because he learned Exponential Marketing Strategies that involves Boundless Opportunity Thinking™, Sam was able to start selling before he was able to produce the final products. He was able to hire a studio manager from day one, ensuring that he could grow his business faster and with a lot less stress. Created, developed and launched a new website that has produced sales EVERY month from the very first month. Many small businesses are still struggling to make their first dollar on the Internet. His website and blog traffic catapulted from 220 visits in the first month to over 1050 in 6 months by leveraging Exponential Internet Marketing Strategies that ensure qualified suspects, prospects and clients find him on Google and other search engines using the most effective and efficient SEO strategies available. His jewelry blog has already published more than 100 posts in the first 6 months – while he was busy launching his new business. Most Australian businesses, don’t have a blog let alone one that has that many valuable posts to inform and educate his clients on topics as varied as Pink Diamond Tiaras, Art Deco Jewelry, and designing your own custom engagement ring. As a result of the various Exponential Marketing campaigns and multiple Pathways To Profits™ being established, with solid Management By Metrics™ to back them up, a 1st year apprentice jeweller was hired within 6 months of the jewelry studio’s opening. Having a generous and philanthropic perspective, Eskae donated $1,435 to The Smith Family through their child sponsorship program in their first year of operations. This is in contrast to small businesses who struggle to make ends meet after several years in business. Sales have steadily increased each month since the initial launch. Eskae introduced environmentally friendly cleaning solutions that required additional research and effort – this is vitally important to the environmentally sustainable footprint that Sam wants to establish for his operations. Eskae is all about having a holistic and socially conscious approach to jewelry making. Successful Endeavours is in the business of making Australian Electronics Manufacturers more profitable and more successful through Electronics Design and Embedded Software Development that leaves more money in your pocket while delivering better products that can be manufactured profitably in Australia and marketed more successfully in both the domestic and International markets. Part of the reason they are able to do this is because they deliberately stayed small and operated as a home based business for many years. Built a new client base. 80% of our business now comes from clients who didn’t know we existed 2 years ago. So why do I care so much about Electronics Manufacture in Australia and in particular, Low Cost Electronics Manufacture of Niche Electronics products Designed and Made in Australia for the world market? In 1946, 90% of the goods used in Australia were made in Australia and Manufacturing was our largest industry. In 2010 that figure had fallen to 10%. This means nearly every manufactured item we use is now made somewhere else. The source for the above figures is AMTIL, The Australian Manufacturing Technology Institute Limited, of which we are a member. We make Electronics and Embedded Software work the way they should, saving you up to 2 out of every 3 dollars you otherwise would have wasted, so you can Manufacture your market leading product in Australia at a profit. It is pretty in your face as a statement but it does reflect what we achieve. We provide Electronics Design, Embedded Software Development, and small scale production for Australian Electronics Manufacturers at a price they can afford without reducing the features or performance of the product and at the same time improving the total cost of ownership. The results are better, smarter, cheaper to make products that allow Australian Electronics Manufacturers to remain cost competitive. Most of our projects are protected by non-disclosure agreements so I will share some that we can be completely open about. 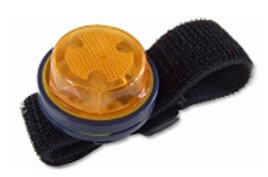 Safeturn bicycle indicator – This device is worn on your wrist and when you raise your arm to indicate is starts flashing. This is an especially good idea at night. It won an episode of The New Inventors and also an Innovic Next Big Thing award. Safeturn had gone to China for manufacture but after a year still didn’t have a working sample from the manufacturer. So we were asked to design it for them. The manufacture still happened in China (you can’t win them all) but at least they now had a successful product. Borgtech. The design of this product received 2 National Awards in 2009.
impact event. There are also wired versions. These are available for rebadging. They are also made in Berwick. 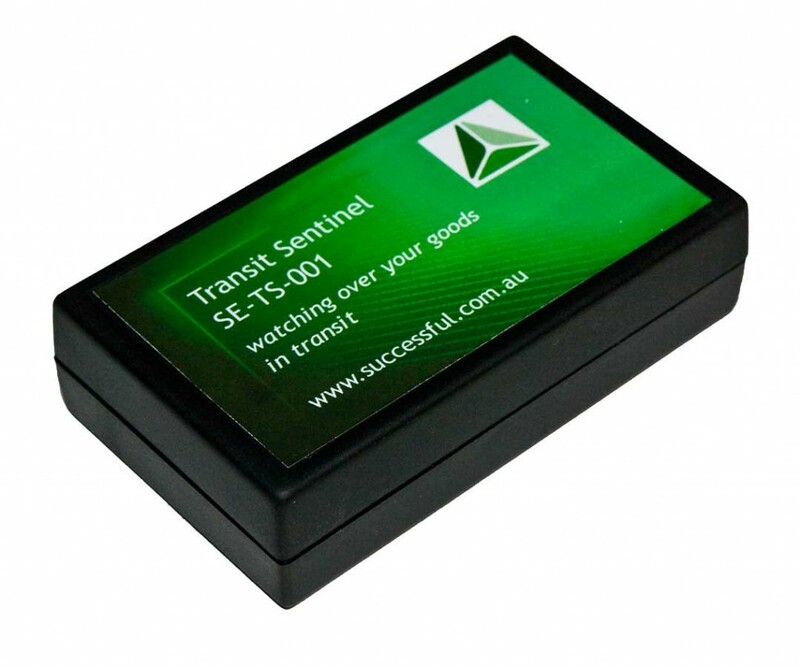 They internal name we use for this is the Transit Sentinel. Our latest product development is for an Australian High Voltage Switchgear manufacturer. It is a power controller for the world market including the USA Smart Grid initiative. This device is used to control capacitor banks that improve the power factor of electrical systems allowing more power to be transferred and used, especially in industrial areas where there are a lot of large motors. We are also manufacturing the controller for the client at our premises and most of the first batch have already been sold and exported.